Back in October we reported the first leaked specs of Nikon's new flagship DSLR, the D800. Now the first pictures of the camera have circulated, and boy does it look like it means business. 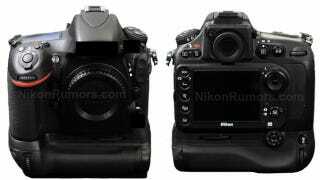 Nikon Rumours has gotten its hands on some images of the new camera, and it looks a lot like a heavily updated D700. Now, the world of photography tends to be one very much of evolution rather than revolution, so a heavy tweaking of an existing model lends weight to the argument that these pictures are the real deal. Here, the camera is fitted with a battery grip which would doubtless be an accessory. Looking at how big the camera would be with the pack removed seems to confirm previous rumours that the D800 will be smaller and lighter than the existing D700. The image of the rear of the camera also shows that the LCD is much bigger than the D700, too. All in, even if it is only a heavy redesign, it looks seriously good. There's no word on any further changes to the specifications we reported the other month, but if you missed it at the time, the big news was that the D800 is expected to pack a 36-megapixel sensor giving you images up to 7360 x 4912 pixels. We don't know quite how Nikon plans to make use of that kind of resolution, but we're looking forward to finding out. The D800 is also rumoured to shoot 1080p video at 30fps and be capable of snapping four frames-a-second bursts.